While traveling through the whole of Thailand, it gave me the impression that the country consistent of 2 distinct landscapes. One - a very flat country with plenty of rice fields otherwise those uncultivated areas rather arid and infertile. In contrast, there are few hills or mountain but when they are seen, the slopes were filled with tropical rain forest. Absolutely green and lush. Impossible for me as a non resident to cover the many places that I wish too, so I better confine myself to the more accessible South which is nearer to Malaysia. This is a special portion of land mass where the peninsula constrict into a narrow Isthmus Of Kra. Only 44 kilometers at its narrowest part near Chumphon. An equally slim mountain range running through as back bone. The land here swept by winds from the Gulf OF Siam from the east and that from the Indian Ocean from the west. This region of Southern Thailand that I travelled frequently has in the north, the mountainous Province of Kanchanaburi. Then all the way running down south, the eastern slope of Bilauktaung Range that separates Thailand with Myanmar. Finally, this land mass broadens in the extreme south to meet the Malay Peninsula. 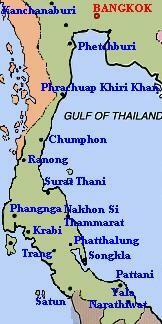 Here there are several Thai Provinces of Satun in the west and in the east, the hilly Province of Narathiwat. The end of the Thai landscape. Continue southwards, the land start the northern segment of another mountain range, the Main Range running through the whole Peninsular Malaysia. I kept mentioning names of mountains as these landscape generates Waterfalls. The urban or rather most of the population in Southern Thailand are concentrated within the few provincial capitals, leaving the rural areas sparsely inhabited. Folks in the cities as well as those in the country sides have little entertainment and with the beautiful landscape and natural resources, in their spare time chooses outdoor living or picnic as the top sports. So recreation areas especially those with rivers and waterfalls are well known recreation areas among the locals. I am impressed to see that they who patronizes the parks are also immensely conscious about the environment. They are all very clean and orderly, making a visit to the park a real pleasure. The local town councils are also in tune with the people by providing good access roads and proper signage, The existence of "waterfalls" strictly speaking recreation parks in an area are well advertised. When the craze for the searching of Waterfalls started and collecting "numbers" became a hobby. With a bit of effort, it is fairly easy for us to pursue the hobby in Malaysia. Trekking and searching is never a problem as we could take a few days off and reward ourselves handsomely for having found a relatively unknown and rarely visited spot. But to extend that adventurous spirit to cover places into Thailand is rather different. That few days we set aside for each venture is never enough. First scuttling to the border from Kuala Lumpur would have taken up 2 traveling days. Then the usual exploration would take another couple of days. But I am afraid of the end result - finding a waterfall in a remote jungle but well trodden area. So looking for waterfalls in the remote parts of southern Thailand, be it done from Kuala Lumpur or Bangkok I find, is never as rewarding as we used to enjoy searching for little known waterfalls in Peninsula. Least of all, not as a venture done over the weekends holiday. Anyway, to familiar yourself with what Southern Thailand has to offer, look at the actual map. It is easier to describe the area and where about of the places that we are dwelling in. Click at the names of each province, a new page with write ups on that province would open. In it would be the names of the known waterfalls. Against the names of waterfalls, there would be new links to that waterfalls if at all, I have posted it up. As in the last category, No.3,the water in the rivers there are unlikely to be suitable for swimming or bathing. In short these places were nothing more than having a swift flowing river with recreational facilities. In short, during the days of my exploration, without having seen the places myself. I would assume that the names of waterfalls in southern Thailand that I had come to know about, to be destinations of picnic areas unless more information and pictures on the internet showing the waterfalls themselves. Then my decision could be made as to whether it is worth the while to hunt that waterfalls. Therefore considering the long journey and the extra efforts needed to venture into the distant land, it is good to be some what prepared. I have visited many remote waterfalls and upon returning home I find it hard to describe the places and the waterfalls. As for hidden and little known waterfalls, I have being to couple but also with disappointing results. Looks like the locals are better waterfalls hunters long before we started this hobby. So when words of an unknown waterfalls reaches your ears, it is not because of the fact that the waterfall is non-existence to the locals or the spectacular segment is not known yet, but more a question of evaluating the waterfalls versus the efforts to be invested. So take your pick, but bear in mind, for a start traveling to the remote parts of southern Thailand is already an interesting options. Waterfalls waiting for you? What are you waiting for!